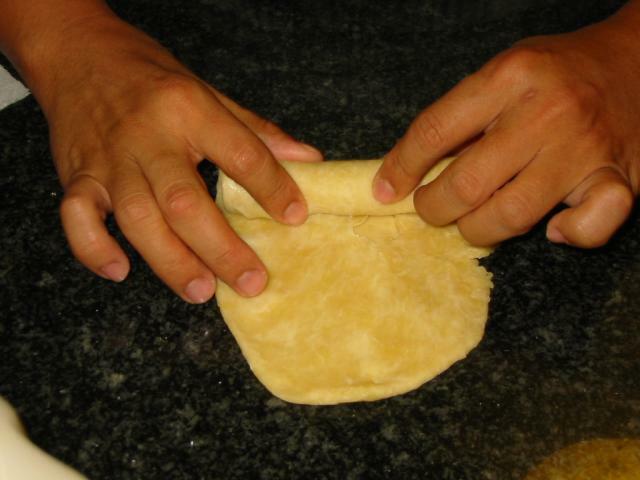 This is a simple Asian puff pastry that can be used in savory as well as sweet dishes. The technique is extremelly easy, and you can achieve the effect of a layered pastry without the complixity of its French counterparts. The puff pastries are normally made into Thai Curry Puffs, which is a savory pastry filled with meats or potatoes and vegetables. However, it can also be made with butter and used as a shell for a sweet filling such as ground peanuts mixed with honey and cinnamon, fruit purees, or stuffed Asian style with red bean paste or shredded coconuts, chopped bananas and palm sugar. The puff pastry here is demonstrated by Pichet Ong, who will answer any question you have himself. Apologies for the blurry pictures. 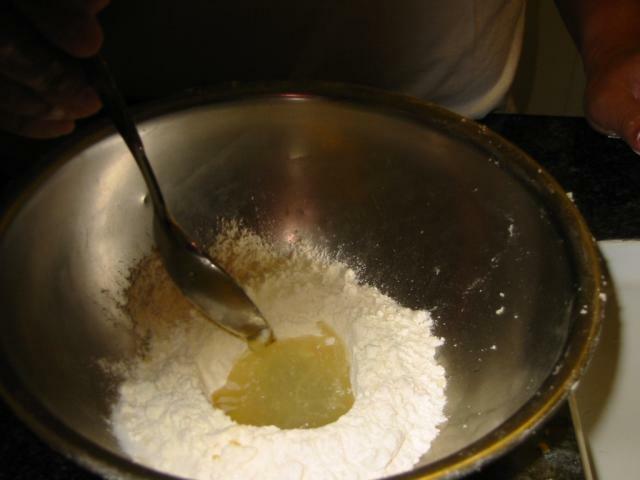 Take 1/2 cup of flour and mix it with 2 tablespoon of vegetable oil either by hand or with a mixer until it forms a smooth ball. Cover with plastic wrap and chill in the refrigerator. 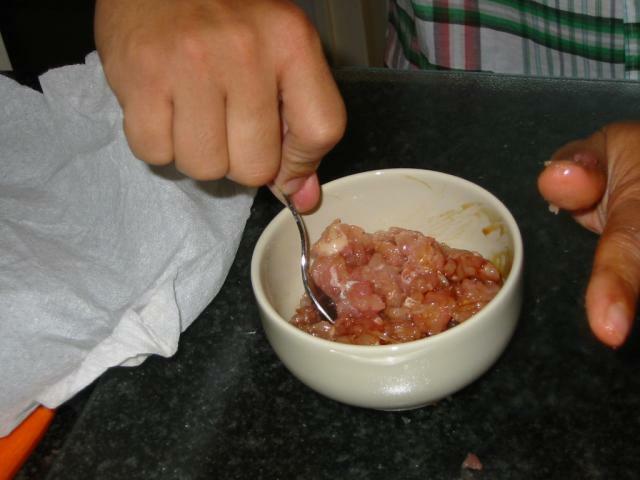 Meanwhile, mix the remaining ingredients together until it forms a smooth ball. Flattened it out with your palm into a flat disk, take the chilled dough out and put the chilled small ball of dough on the large disk. 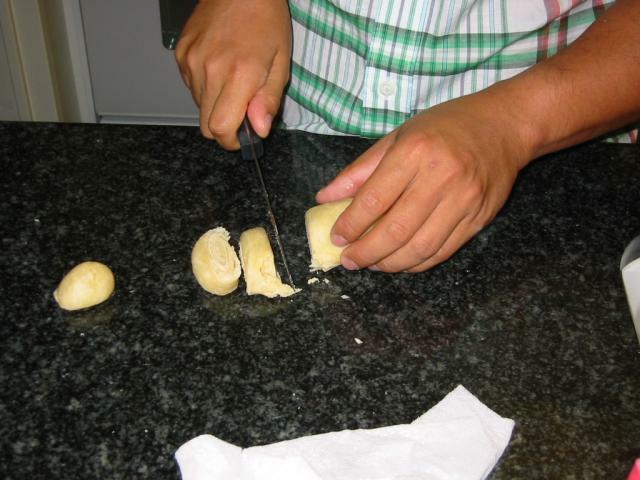 Pat it into a long shape and roll it out with a rolling pin into a rectangular sheet. Roll the sheets away from you into a jellyroll shape. Lightly squeeze it with your hands to make it tighter. Put it back in the refrigeratpor and let it rest for 10 minutes. 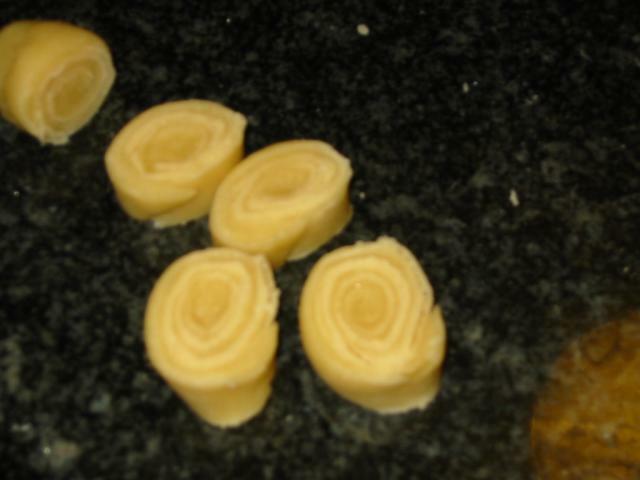 Slice the roll crosswise into 1/2 inch to 3/4 inch pieces. Take each round and turn it out with your thumbs to make it into the shape of a bowl. 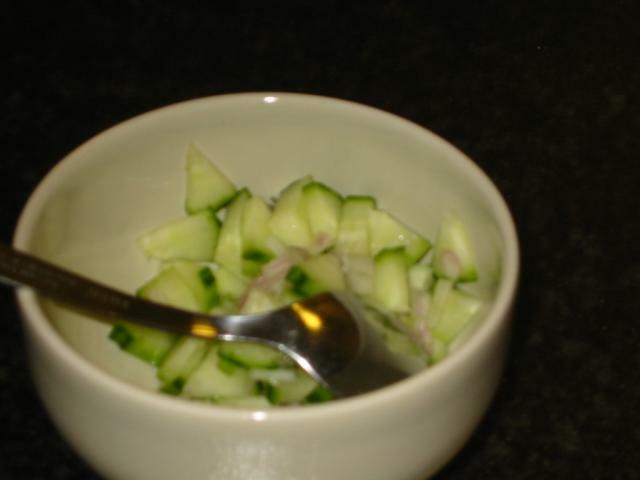 Dab some water along the edges, bring them together and crimp. The pastries can be baked or deep fried and the ingredients should make enough to serve four. 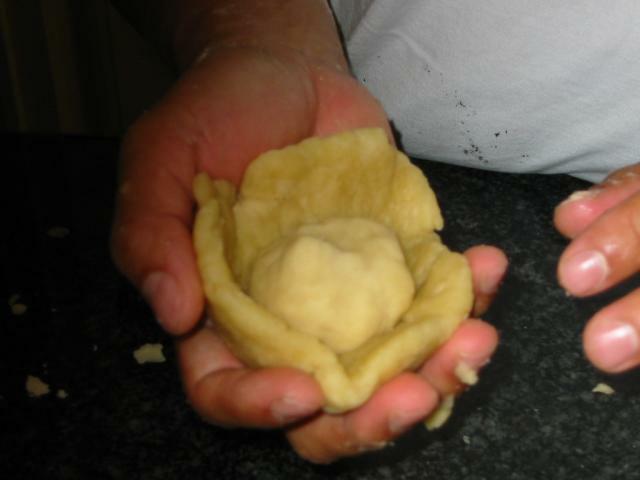 A classic example of use of this pastry is the Curry Puff, popular iin Thai restaurants. 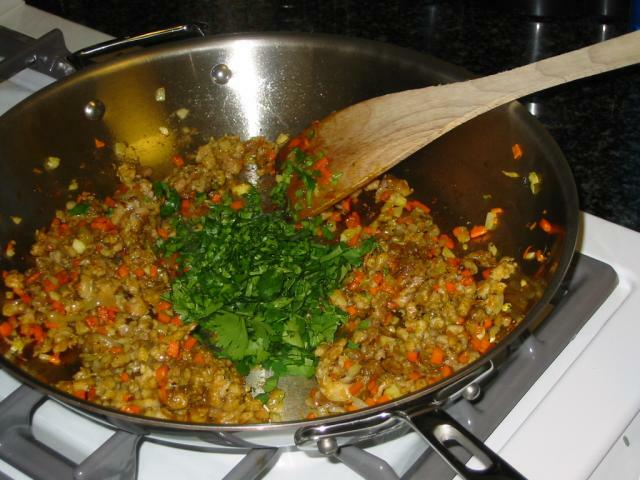 Stir all the ingredients together and let it stand for at least 10 minutes. This part could be made a day ahead. Marinade the chicken in all the sauce and stir in the curry powder and the white peppers. 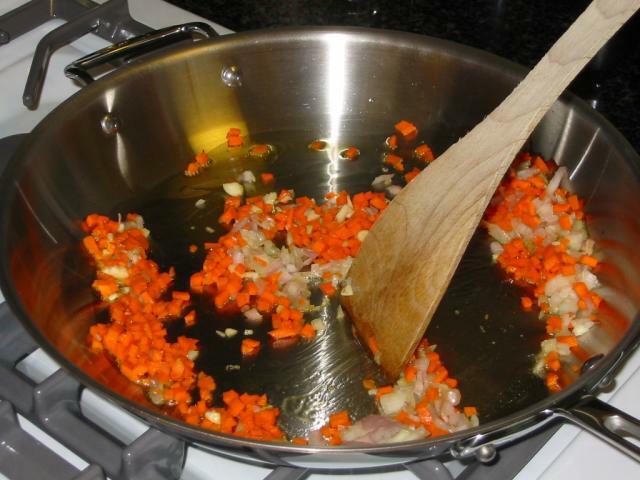 Heats up 2 tablespoon of vegetable oil until hot, sauté the shallots garlic and carrots until it release the flavors. Add the marinaded chicken. saute for another two minutes. When it cools, this could be filled into the puff pastry to make little appetizers. Pichet Ong will be a guest on the pastry and baking board. He hopes to change the perception of pastry to show that it's not just about desserts. In case anyone may not be aware, Chef Ong is currently being featured in our P & B Forum. Please look here. You're welcome to ask Chef Ong any questions about this Demo right here on this thread. If you have any other questions or thoughts you'd like to share with him, about him or his career or other techniques, please post those on the Focus thread. I have to admit I've never heard of Asian Puff Pastry before. I'm wondering if I can draw a similarity to it.........is it similar to the Indian samosa and American pie dough? 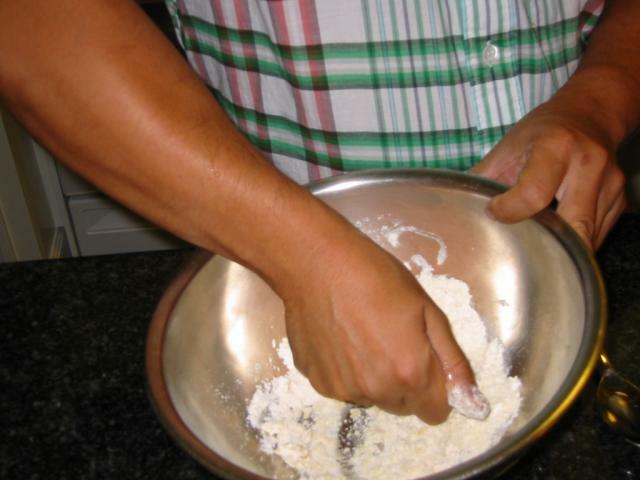 Is it widely used in Asia as pie dough is in the US?.......flaky crust adaptable to a wide variety of fillings..........? I'm very intrigued by this recipe and I would like to try it out soon. I notice that the finished example you show looks deep fried. Do you have a photo of what they look like baked? Also, what temperature and times to you usually bake them at? This is really neat, and everything looks good! However, I wonder whether the Madras curry powder is an "inauthentic" shortcut. I can't imagine a curry puff in Malaysia (for example) being made that way, though I could be wrong and stand to be corrected. I know that Thais use various curry pastes and don't always make their own, but do they use pre-made curry powders much? Yes, Wendy. 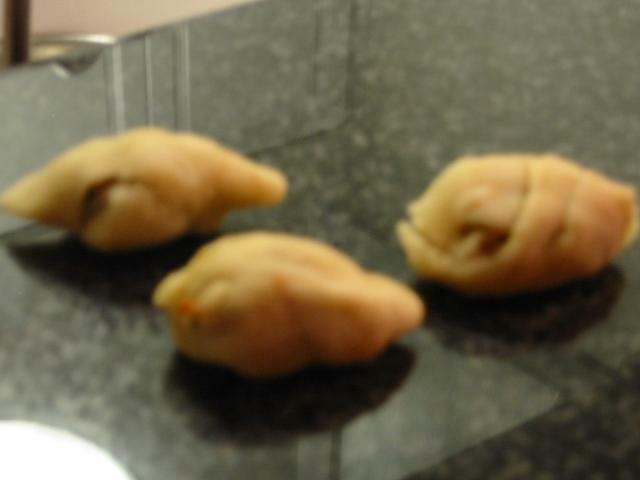 Curry puffs are pretty much a kind of samosa. 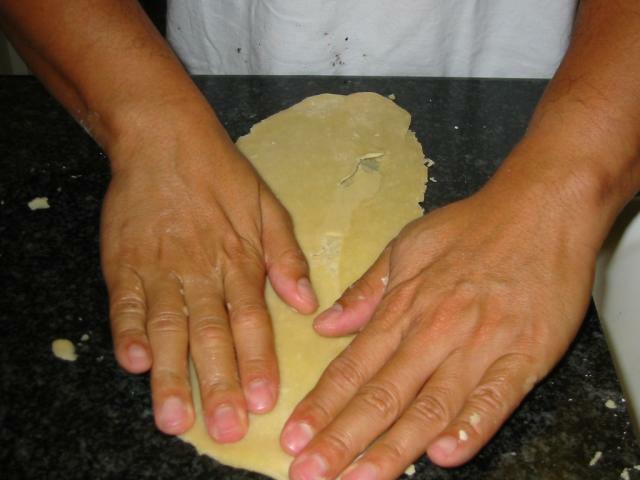 In one or another Indian cookbook, I found a variation on parathas that uses a fairly similar technique. Except, of course, they used ghee for the oil. They were easy and quick to make, and even more so to eat. 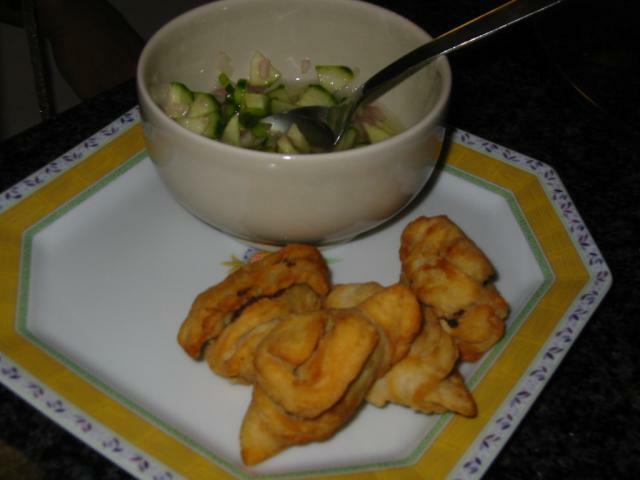 The dough that i call Asian puff pastry here is similar to one that you would find in mediterranean cooking. The name of it escapes me at the moment. 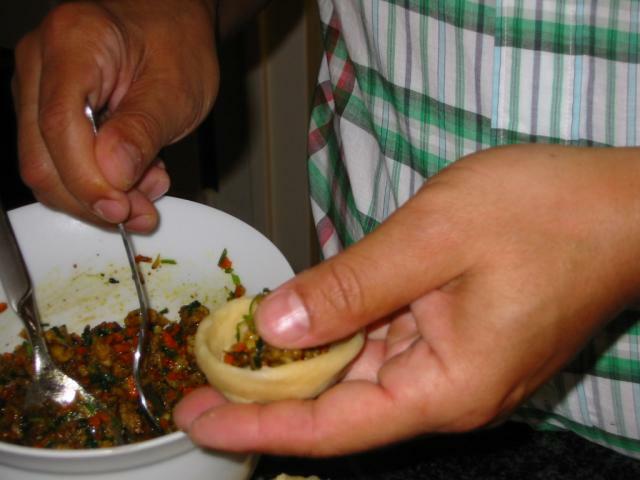 These days, the concept of using pastry to encase a filling is what a samosa is. Different chefs use different types of wrapping pastry. 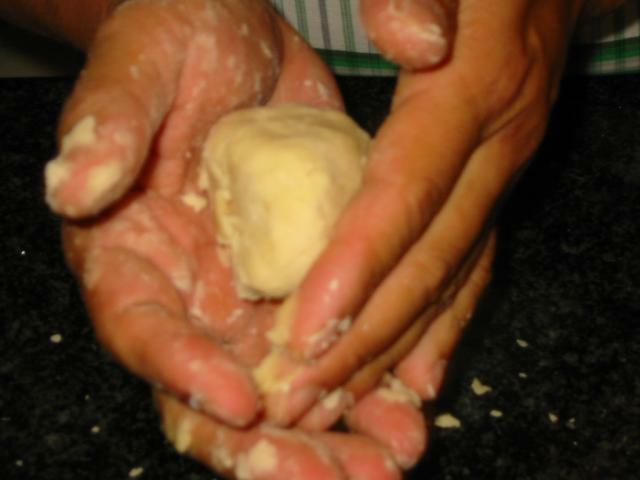 The outside dough of my recipe which is flour mixed with oil and water is similar in concept to that of traditional dough. At Spice Market, for the chicken samosa, brick pastry is used. While a baked banana chocolate samosa I once did I used a butter based pastry. I'm sorry I do not have pictures of the products baked. However, it should look similar to the fried variety. I would brush the puffs lightly with oil and bake them at 375 degrees for about 12-15 minutes. 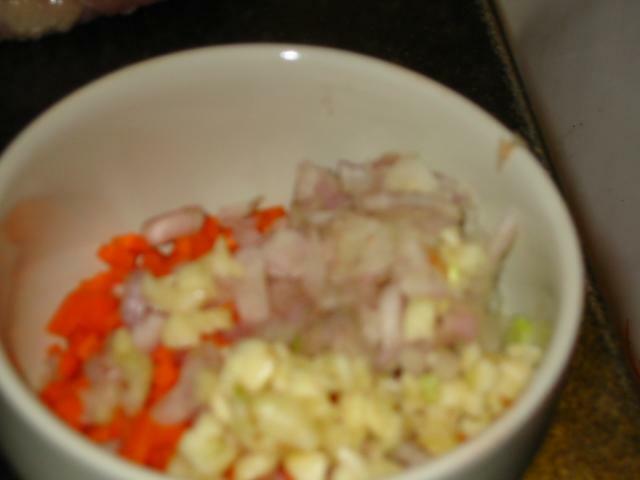 Just make sure with any filling you put in there is thoroughly cooked if it is going to contain meat and that the filling is on the dry side. What differences were you looking for between the butter based one for the banana, and the Brik pastry (which I love) for the chicken one? The butter based one is basically a pate brisee recipe that is enriched with custard powder that enables the samosa to hold up its shape after baked. It is also softer in texture and works well with chocolate and banana as it is less messy when broken into. The brik pastry that they use for savory application is fried and i think that works good because it is served in a vinegar based dipping sauce. I have to admit, to a gourmand like me, yes using commercially available curry powder is a shortcut. However, it is commonly (and authentically) used all over Southeast Asia, just as much as soy sauce is, especially in a case like this when it is used to accent a recipe. In Thailand, one would find many spice shops selling wonderful house blends of curry powder, indefinitely better than the Madras version I use. However, my focus of the demo was on the pastry. Hence less time (and money) was spent on the spices. So that's what the custard powder is used for? I thought maybe taste might be be a factor. Sometimes I goose , say, a waflle batter with custard powder because I find I get an almost doughnutty taste from it. Yes no doubt the custard powder also adds an enriched flavor to the dough. 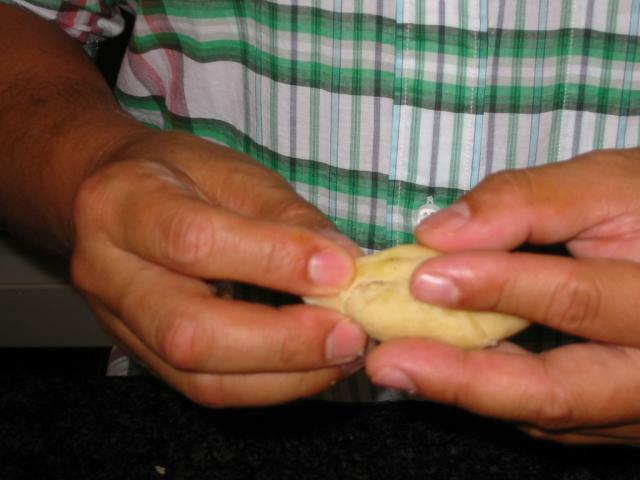 But as additional dry ingredient, it also enables the samosa to hold it shape without flattening when baking. 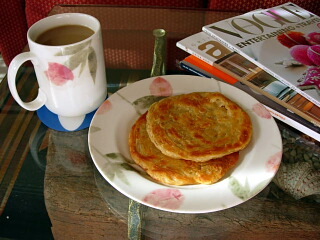 This is a great recipe, a while back I followed a similar one to make some roti. Although, it wasn't meant to be eaten as a sweet bread, I made the pastry with butter. The puff pastry was fragrant, flaky and crispy. Thank you, Chef Ong and Bond Girl. Yes, the same recipe, one can also make Scallion Pan Cakes by using scallion oil and brushing the layers with more scallion oil. I think the name of the pastry I have in mind that is similar in Mediterranean cooking is Seskoulopita. This is invaluable, thank you! I can think of dozens of uses for this pastry here in Japan! Thanks for the reply, and for giving so generously of your time! Strangely enough this is almost the recipe for Maltese (see http://forums.egullet.org/index.php?showtopic=88129 ) pastizzi but instead or the dough beign rolled in with butter spreaded but in pastizzi the dough is rolled twice with butter and the shaping is perhaps fancier if not more elaborated.